Krazy Krouse Kids: "My Mom Was a Little Bit Angry"
It was a quiet Sunday evening. Caroline was playing so nicely and doing her "projects." I was very impressed with how well she was using the scissors. She was making letters and snakes and all kinds of creative things with her "little scissors" and construction paper. It was going all too well. Before long, she leaves the room and then comes back in with a smile on her face. She was pointing to her hair. I said "Caroline, what did you do" knowing exactly what she had done. "Well I just cut my hair" she said. I asked her why she cut her hair. "Well, it was just getting in my face." Ok, well maybe if she would let me brush it or put a bow in it we wouldn't have that problem. 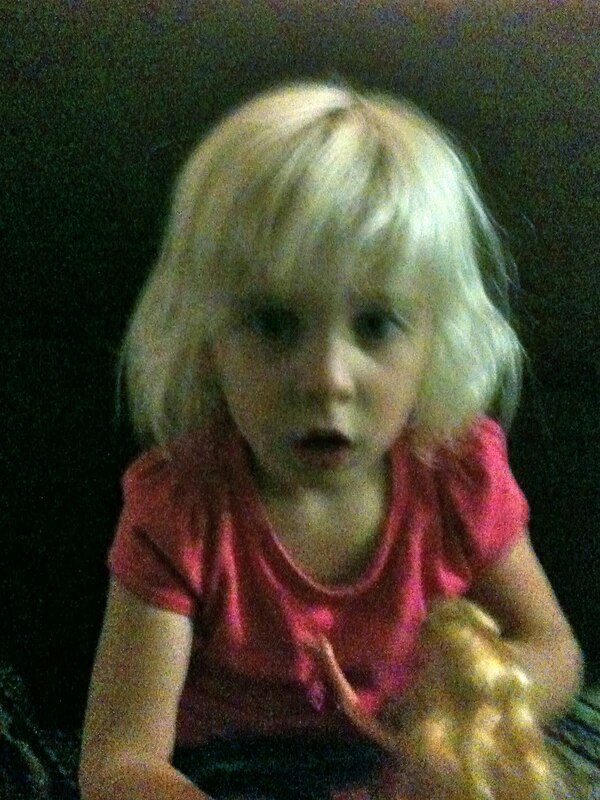 Huge blonde chunks were missing from the front and side of her hair. It looked like a really bad attempt at bangs. Not cool. After all, it has only taken the better part of her life to get all her hair even. I was not happy, but I was thankful that school pictures had already been taken and I do acknowledge that it could have been worse. I asked her what her teacher said about her haircut when I picked her up from school the next day. She said "Well, Mrs. Frank, Mrs. Tyree and Mrs. Johnson didn't really like it." I said "Oh really...did you tell them who cut your hair?" Caroline then said "Well I told them that my hair was in my face and I just had to cut it and my Mom was a little bit angry." At least she picked up on the fact that indeed, I was a little bit angry. reminds me of when someone pierced her own ears... just sayin. Mary - if it makes you feel any better, just befor he started kindergarden Miles got Ryan's beard-trimmers and shaved a "reverse mohawk" down the center of his head. we had to shave all his hair off.